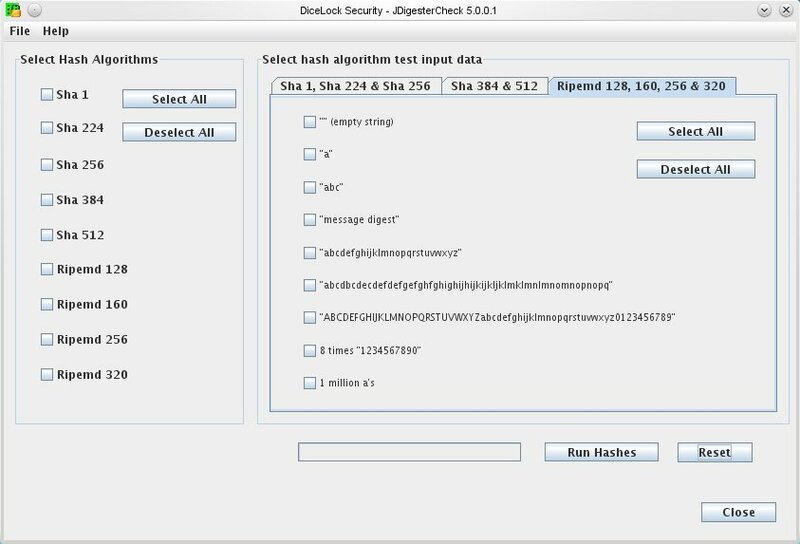 FREE DiceLock Security JDigesterCheck GUI and JHashDigester .jar extension library. If in your process or software applications you have need for generating hash values for different type of information you can incorporate JHashDigester .jar extension library in your applications to generate the hash you need. Incorporate hash processors in your applications. JHashDiegester .jar extension library contains classes implementing SHA 1, SHA 224, SHA 256, SHA 384, SHA 512, RIPEMD 128, RIPEMD 160, RIPEMD 256, RIPEMD 320 hash algorithms. JHashDigester 5.0.0.1 is able to share data with JDiceChecker 5.0.0.1 random number test and JDiceLock 5.0.0.1 encryption cipher product. Windows XP, Vista and 7 native installer. JHashDigester.jar can be copied to [PATH_TO_JAVA]\jre\lib\ext\ to be used as an extension library to be used by any Java application. Execute SetupJHashDigester.msi and follow indications. Source Code: Java source code and JDeveloper projects available at DiceLock Security web site. The .NET Framework contains components that present standard Open/Save dialog boxes. We developed same dialogs with image preview box. You can set properties values at design-time and easily change image in preview box at run time. Habari Client for OpenMQ is a library which provides easy access to the Open MQ message broker. It supports Delphi 2009 and Free Pasca 2.6 and newer. The Royalty free Barcode Reader SDK for Microsoft Windows allows you to integrate barcode recognition into C, C++, VB6, VB.NET, C#, .NET and Java applications. PDFsearchCmd - A developer commandline-exe for fulltextsearch ... Royalty free! Different options how to search/find! For all scripting- and programming-languages. License4J is a Java library for java software licensing. It is designed to be easy to use and integrate in your Java application. License4J creates license files and secure serial numbers. Includes a free to use,distribute floating license server. HsVoipSDK is an audio streaming / voice over IP SDK in C / C++. HsVoipSDK is shipped with full C source code and includes the Audio library, RTP protocol library and Socket interface library for Windows. The royalty free Barcode Reader SDK for Android allows you to integrate barcode recognition functionality into various types of Java android software products. DiceLock Security libHashDigester-x .so Library - Add hash algorithms in your applications. The C++ library implements SHA 1, SHA 224, SHA 256, SHA 384, SHA 512, RIPEMD 128, RIPEMD 160, RIPEMD 256, RIPEMD 320. Allows to work with memory kept in RAM. Gaia is free-of-charge library for programming Java Swing client or client / server applications with advanced components (like JTreeTable) and building forms from XML description files. It also contains XML support and other utilities. ABCUpload .NET enhances the basic .NET file upload functionality. Advanced features like Pure HTML Progress Bar ? support, GigUpload ? technology for truly massive uploads and MacBinary decoding. All in 100% Managed Code. This site does not contain serial number, crack, keygen JDigesterCheck - Windows installer serial number : serial number is the simplest type of crack. A serial number(cdkey,product key,etc) is register the program as you may already know. a crack or keygen may contain harmful software. If you cannot find the exact version you want, just give it a try. for more information read .nfo/.txt/.diz file include in zipped file.